Don Wennerstrom has a piece of advice he likes to give that works pretty well for new or returning runners. It also sounds a lot like a good life philosophy. Look for small goals first, he says. Shoot to make it to that next light pole. Then maybe go for one more. Pick another spot, farther out on the horizon. You’ve got that one now, so run for just one more, knocking out those goals on the way to something bigger. Arthur and Meg Sarakas opened Running Wild in 1986 and turned it into something of a gathering spot for local runners. Wennerstrom bought it from the couple in 2007 after working in the industry since 1999 and managing a running store for years in Boca Raton. 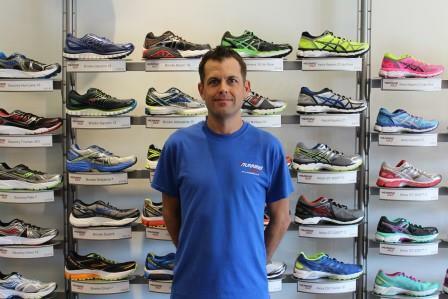 A Fort Lauderdale native and marathon regular, Wennerstrom had dreamed of owning his own place, and he expanded the idea of the store being a spot where runners could meet up. Perhaps the place is known more than anything for an event that started out as a chance encounter. Not long after he opened the store, Wennerstrom says a manager at the Weston store dropped in to ask about group runs. So they decided to start one themselves. They called it the Funky Free Run, a Thursday night run that attracted 28 people the first time they attempted it. At the store, Wennerstrom says one of his favorite moments is getting a new runner or someone getting back to the sport. It’s a daily occurrence, and these days he’s seeing more people who haven’t been out in decades and decided to return to the sport. He’s got a standard “couch-to-5K” training regimen that’ll get them on their path to a regular run or an organized race. In addition to his simple light pole goal-setting, he also suggests they should do yoga, a good stretching complement to running, and to either join a group run or find a partner to offer encouragement. That starts, he says, with just one light pole. And then another. The 5K leaves Running Wild (2563 E. Sunrise Blvd., Fort Lauderdale, 954-565-9400, runningwild.com) at 6:30 p.m. every Thursday for a route over to the beach, along A1A and ending at the Westin Fort Lauderdale Beach Resort. PHOTO: Don Wennerstrom at Running Wild in Fort Lauderdale (courtesy).